"Or some interesting ways to get some variety into those boring panels where some dumb writer has a bunch of lame characters sitting around and talking for page after page!" This suggests clearly that these panels were intended to add life to conversational style scenes with very little action as a way of making the scene more visually interesting. Hence, generally you wouldn't apply these frames to action sequences - though I'm sure some would work. Although intended for cartoonist and comic book artists many, if not all, of the panels translate reasonably well to film and animation and could serve as a source of inspiration for giving your own films a more visually interesting look. This idea is demonstrated in the Youtube video below which is a film representation of the 22 panels by Kill Vampire Lincoln Productions. If you're already creating films or animations you've probably already used many of the panels already. I know I often make use of the panel 6 technique in many of my own animations - essentially it's an exterior shot but you can still hear the characters speaking as clearly as if you're standing next to them. 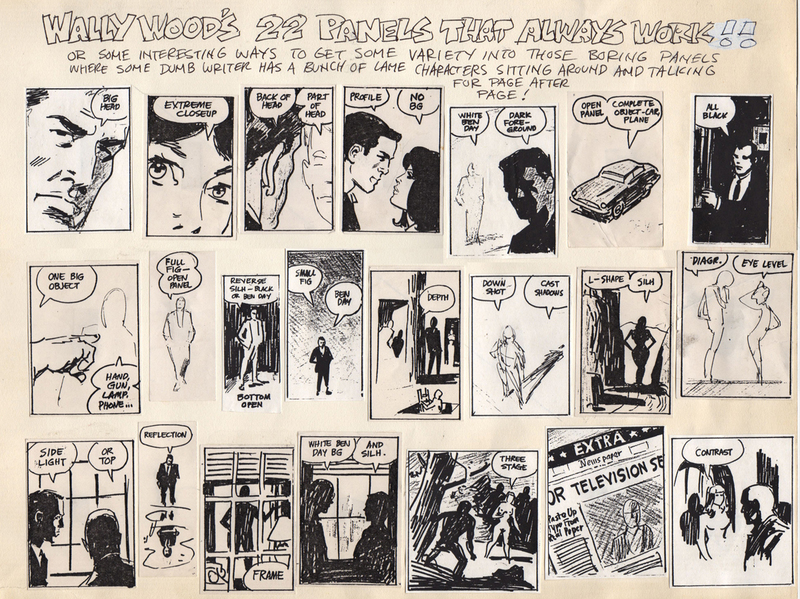 Wally Wood's 22 panels aren't the only shots that always work. In fact the original drawn version by Wally had 24 panels so there's at least two more that always work. However if you're are looking for ways to make a conversational scene more visually interesting and coming up a blank, adding in one or two of these panels may just be the solution. That was pretty cool. I'd love to see more of them put to use on GA. I've decided to challenge myself to try and utilize a few of the more difficult ones to implement on GA on some future animations. I'd be interested to see how you go with that. As a film maker, looking for interesting camera angles is something you start to do when watching other people's films. That's actually where I picked up a lot of the angles that I use, that just happen to match with Wally's 22 panels. It's only recently that I discovered Wally's work.